On Facebook, a group  is keeping a running tally of those who have been detained, as well as those who have since been released. Detainees number 38, with only the two above confirmed to be released thus far. The March 15 in Syri a can be our January 25 , do not underestimate it. If our dear Syrian brothers and sisters managed to protest till Friday , till the Friday prayers it will be a great triumph. 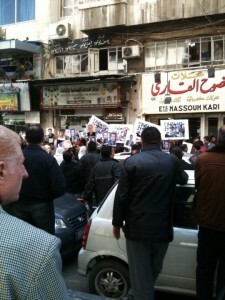 Yesterday sources in Syria speak that not less 300 were arrested during and after the protests.